At the beginning of the 18th century the village of Marylebone consisted of just a smattering of houses, but as London began to grow during the Georgian period many attractive houses were developed and by 1792-1799 the whole area from Oxford Street to the New Road (Marylebone Road) was awash with beautiful, large Georgian styled houses, known by their rectangular sash windows and parapets which give the appearance of a flat roof. Cavendish Square, in particular, became a magnet for the fashionable and wealthy. 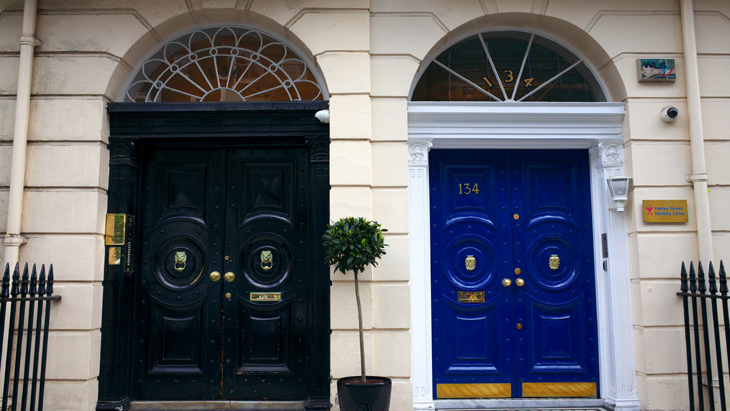 Harley Street is owned by the de Walden family and managed by the Howard de Walden Estate. In 1711 the grid of streets around Harley Street, known as The Estate, was passed to Henrietta Cavendish Holles (the Duke of Newcastle's daughter) who married Edward Harley (the 2nd Earl of Oxford). Between 1715 and 1720, Edward, with the assistance of architect John Prince, decided to develop the streets around Cavendish Square for residential purposes naming many of the streets after members of the family. When Edward died the Estate passed to his daughter, Margaret Cavendish Harley who married the second Duke of Portland, and the area became known as The Portland Estate. The Dukes of Portland had ownership for five generations until the fifth Duke died without issue in 1879 and the land passed to Lucy Joan Bentinck, widow of the 6th Baron Howard de Walden and thus it became the Howard de Walden Estate. By 1860 many doctors had moved into Harley Street, choosing the area because of the quality housing, the central location as well as the accessibility to major train stations such as Kings Cross St Pancras and Marylebone. As more and more doctors moved to the area they invited colleagues to work with them from their prestigious homes and Harley Street began to thrive as a medical centre, especially after the Medical Society of London opened in Chandos Street in 1873 then the Royal Society of Medicine in Wimpole Street in 1912. Since the nineteenth century the number of doctors, hospitals and medical organisations in and around Harley Street has greatly increased. Records show that there were around 20 doctors in 1860, 80 by 1900 and almost 200 by 1914. When the National Health Service was established in 1948 there were around 1,500. Among the many famous and talented doctors to have practiced in Harley Street over the years was the great British surgeon and polymath Sir Henry Thompson in the 1870s who specialised in surgery of the genito-urinary tract and was appointed surgeon-extraordinaire to the King of Brussels, and Doctor Edward Bach who practiced from Harley Street in the 1920s as a specialist in vaccines and bacteriology before moving to the London Homeopathic Hospital then developing the Bach Flower Remedies. Today there are over 3,000 people employed in the Harley Street area and the private clinics are modern, comfortable and welcoming; a far cry from the original days when Harley Street doctors arranged their own appointments and dealt with correspondence by letter in candle light and resided in the house itself. Today, as you would expect, practices are run by highly qualified, competent and professional medical and auxiliary staff using state of the art technology and equipment. Find the perfect nose for your face . What's the difference between the two? How can you tell?. Image of Lionel Logue is reproduced with the kind courtesy of the Logue family. Site designed by Howell Penny.